As its name suggests, dark gum pigmentation refers to a discoloration, or pigmentation, of the gums in the mouth. 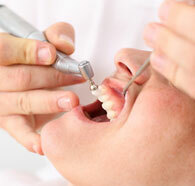 The condition can affect the entire gums, or just patches of the gums. Though it is not a life-threatening condition, the quality of your smile can be severely impacted if it goes left untreated. Since the gums are a visible frame around your teeth, gum discoloration can have a negative impact on the overall attractiveness of your smile, as well as your self-confidence. For this reason, this cosmetic procedure is becoming more and more popular among those interested in modifying their physical facial appearance. Gum Depigmentation vaporizes and removes a thin top layer of the gum tissue, destroying the cells that produce melanin. As new tissue is created during healing, it tends to be pink rather than brown. The treatment may require a local anesthetic injection and has a short recovery time with manageable discomfort. Sometime depending on the colour and depth of the dark patch, it could take several sessions to achieve the desired degree of lightening. Bright Smile Dental and Orthodontic Center is one of handful clinics in Dubai that offers this treatment equiped with the latest laser equipment. Your teeth come under constant attack from the starches and sugars present in our food which are released as we eat. When this combines with plaque – the sticky bacterial film that forms on the teeth over time, it produces an acid which is harmful to our teeth. When you look in the mirror and smile, are you happy with the results? Some people are happy, some are not. In some cases, too much of their gums is visible around their teeth which creates a “gummy” look. Others may dislike their smile because their gums have receded so much that their teeth look much longer than normal. Our area is next to the famous city walk. It is the same building of 2XL Furniture, located between Life Pharmacy and Aswaq Supermarket, and opposite of Emarat Petrol Station. © Copyright 2019 Bright Smile. All Rights Reserved.